After houses, cars are among the most expensive purchases people make. A number of carmakers and retailers are trying to make it one of the least by turning car ownership into a subscription. Volvo is the latest to join Ford, Cadillac, and Porsche to offer a a monthly subscription car service. On Nov. 29 at the LA Auto Show, Volvo announced a XC40 crossover SUV that can be had for $600 a month, reports Endgadget. The monthly fee under the ”Care by Volvo” program includes the car, maintenance, insurance, and concierge service with no commitment to renew beyond 30 days. Compared to a lease, subscription services tend to be much shorter in duration (days or weeks), offer the ability to swap out cars as well as extra services and less stringent credit requirements. Most are also turning to the smartphone, rather than then dealership as the way to close the deal. Car sharing service Car2Go lets you rent cars by the day, hour, or minute in many North American cities. The startup Fair is letting customers shop, get approved, and pay for a car on their smartphone with a monthly contract that’s less expensive than a lease. Fair says it uses driver’s license, bank account, and credit information to identify the right-priced car, and includes a limited warranty, routine maintenance, and roadside assistance. Customers can return cars on just five days’ notice. 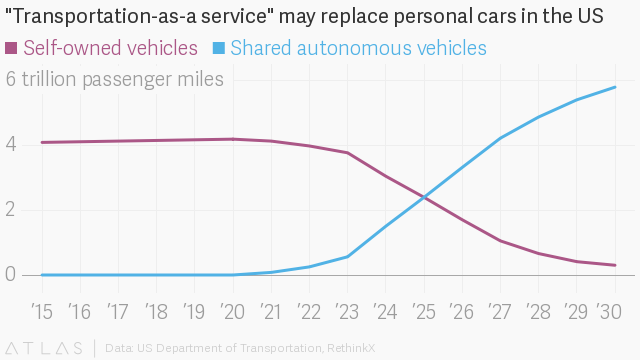 Such car services are a step on the path to a mobility economy allowing people to buy just the amount of transportation services they need on demand. The vision, dubbed the transportation cloud, sees fleets of self-driving electric cars roaming cities and suburbs offering on-demand transportation at rock-bottom prices thanks to low maintenance, cheap fuel costs, and the ability to work around the clock. RethinkX, a Bay Area think tank, predicts (pdf) autonomous electric vehicles could account for 95% of all U.S. passenger miles traveled in the US by 2030. Experts argue that the potential transition to a shared, autonomous, electric future is still decades away. But the signs are there. On Nov. 20, Uber struck a deal to buy about $1 billion worth of self-driving cars from Volvo, and admits that its business model only works once self-driving cars replace human drivers. Uber’s purchase is among the largest commercial orders for self-driving cars yet. It probably won’t stay that way for long. Correction: A previous version of this post misstated the employer for Atif Rafiq. It is Volvo, not BMW.